I need to change the default blog page and corresponding URL. Have repeatedly tried, clicking save changes etc, only to receive the error message “Do you really want to leave this page your updates are not saved.” I’ve cleared cookies, rebooted, logged out of WordPress on every device… can’t imagine why it won’t save. HELP! The blog I need help with is vickijorene.wordpress.com. 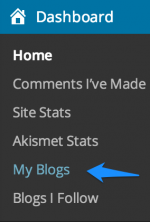 I need to change the default blog page and corresponding URL. Do you want to purchase your own custom domain? All that changes when you are domain mapping is the URL and nothing else. The content stays exactly where it is. What domain mapping does its create a seamless transfer between the underlying .wordpress.com blog URLs to the new domain URLs no matter where they are on the internet. Visitors who click the underlying .wordpress.com blog URLs will be seamlessly redirected to the exact same content under the new domain URLs. Very confusing as the information in the fill in areas to right is now correct. I don’t want to change my email or make a new user name… I just want to change the default to the one I am currently using. In fact, I see it is defaulting to the account I never use right now, and yet I have changed settings. Every WordPress.COM blog has a sole owner and it is the person with the WordPress.COM username account, who registered the blog under that username account and their associated email address and purchased any upgrades. You can have as many blogs registered under any username account as you wish but there will only be a single gravatar for each username account and you can only link to a single Primary blog. Yes… sorta! Are you saying that I can’t change my primary blog? That’s all I want to do. The orginal blog name/url is outdated to me. I’d like to just change my primary blog. The same gravatar for all the blogs is fine… you’re saying it goes with the primary blog, right? Guess I’m still a bit confused because under account settings it let me change my primary “site” and web address to the ones I want but still have the OTHER old web address under my gravatar. I feel like they’re conflicting? On another scary note… since I tried to change my primary blog/site,the link for my poetry class has disappeared in my list of Blogs I Follow. Now I have no way to get into the commons. Did I disable something in my attempt to change info? We need to know exactly how many username accounts you have and what they are. We need to know exactly which username account you are referring to. We need to know exactly which blogs you are referring to have been registered under that account. The topic ‘Account Settings won't update change of main blog’ is closed to new replies.